We will begin our Saturday hours on 9/22/18 from 10AM - 5PM. Tue, Apr 30, 11:00 A.M.
What is "the cloud"? Learn the basics at this workshop. Space may be limited. Thu, May 2, 10:00 A.M.
Thu, May 9, 10:00 A.M.
Thu, May 23, 10:00 A.M.
Thu, May 30, 10:00 A.M. The Fox Chase area was originally settled by Swedes who sailed up the Pennypack Creek around 1645 and built a blockhouse as protection against the Lenni Lenape Indians. English colonists later took over the settlement and the blockhouse, which became part of a large country residence named the Ury House. George Washington, Thomas Jefferson, John Adams, and John James Audubon were entertained there. Fox Chase Hotel, built in the 18th century, was a favorite gathering place for fox hunters. By the 19th century, the area was full of farms and summer estates, becoming a part of Philadelphia in 1854. In October 1951, volunteers and members of the Fox Chase Civic League renovated the first floor of an old school building at Rhawn and Jeanes streets for a library. However, by the mid-60's, the library had outgrown the old building. Half the books were stored away and there was only enough room for a few tables and chairs. The Friends of the Fox Chase Library worked hard to get a new library put in the city's capital budget. In 1967, the old school was torn down and a trailer provided temporary library service. All the effort paid off on August 26, 1968 when the new library opened. 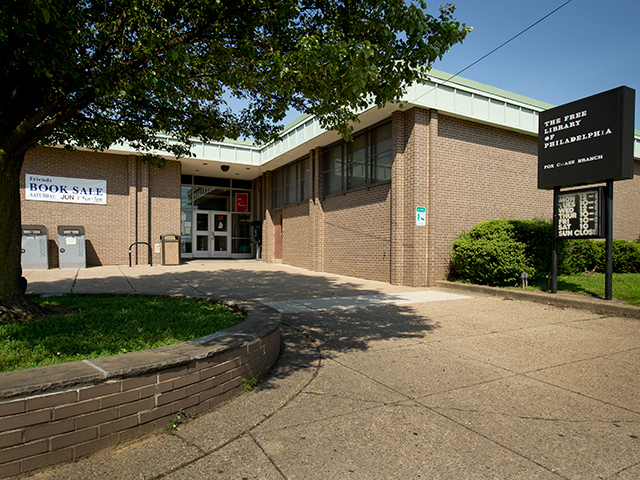 The branch was renovated in 1999 as part of the "Changing Lives" campaign, which refurbished branch libraries and brought Internet access to every library. When you visit the library, take a look at the garden. 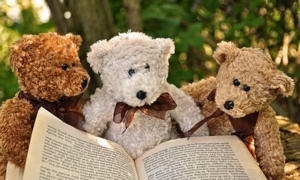 You'll find "The Three Bears," a stone sculpture by artist and author George Papashvily.